A selection of commercially available maps. 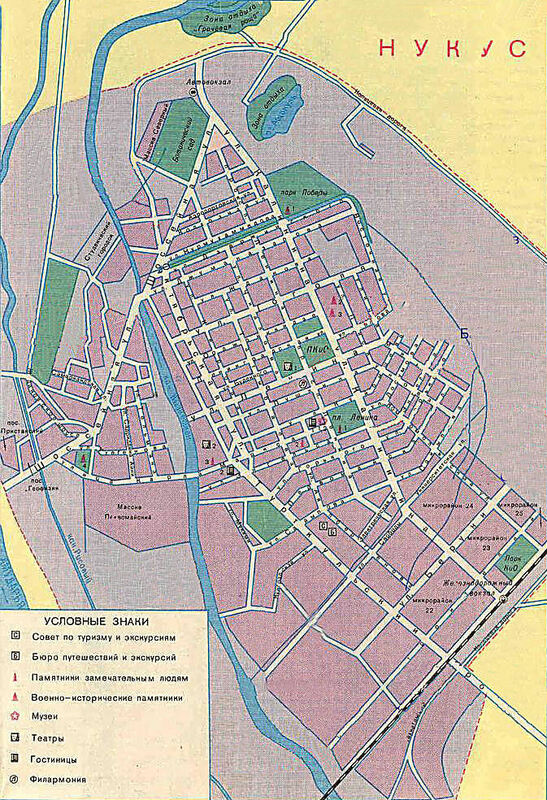 In our opinion the best tourist map for Qaraqalpaqstan is the Viennese publisher Freytag & Bernt's "Central Asia, 1:1,750,00" (17½km per cm or just under 28 miles per inch), which covers most of Soviet Central Asia and part of southern Kazakhstan. 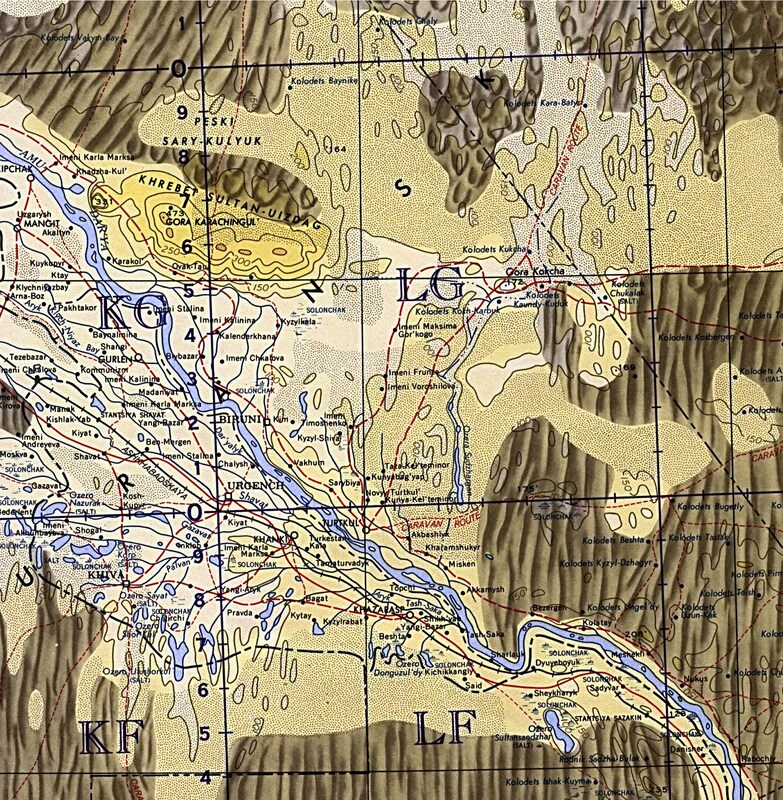 Coverage of the delta on Freytag & Bernt's map of "Central Asia". The 1:1,500,000 map published by the Italian company Viaggi Dell'Elefante is also quite good, although currently out of print. 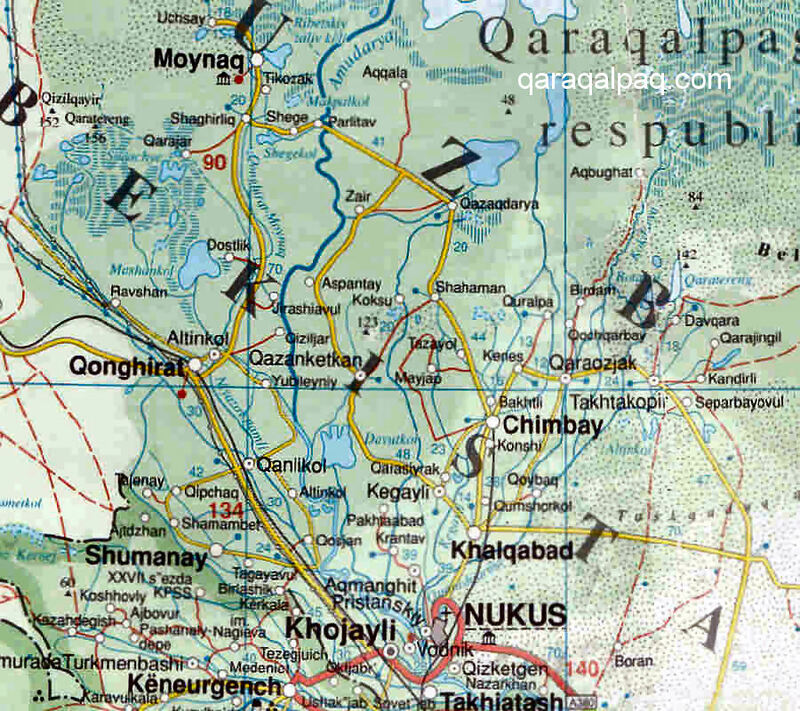 There is also a relatively up-to-date map of the Republic of Qaraqalpaqstan, made in 2002-2003 on a scale of 1:1,000,000 (10km per cm), currently available from booksellers in Tashkent for a few dollars. It was published by Uzgeodezkadastra in 2004. There is a sister map covering the neighbouring Khorezm viloyati. 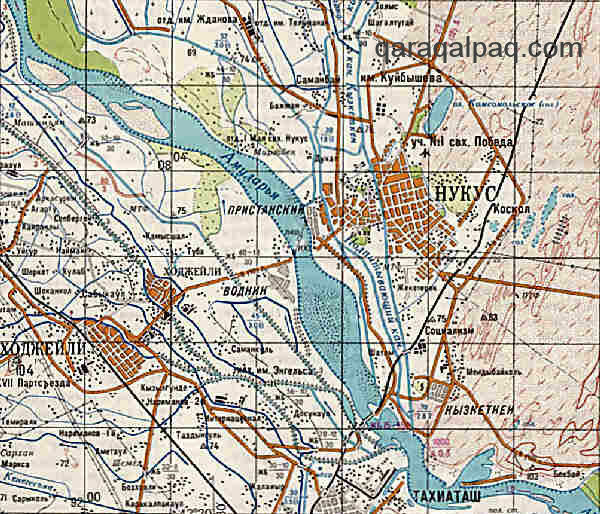 For exploring the delta in detail we recommend the very much higher-quality Soviet military topographic map series. These are available in various scales ranging from 1:500,000; 1:200,000; 1:100,000; 1:50,000; and down to 1:10,000 for certain city maps. They were initially made in 1942 and were partially updated in 1978 and 1989 so by now are somewhat out of date, especially in regard to the depictions of the shorelines of the Aral Sea. The 1:200,000 series (2km per cm) is by far the most practical but is difficult to come by. An understanding of the Cyrillic alphabet is necessary when using these maps. A detail from the 1:200,000 scale military map covering No'kis. Each sheet includes information printed on its reverse covering topics such as population centres, road network, relief and soils, local hydrography, vegetation, and climate. There are 13 sheets covering the Amu Darya delta and the (old) southern coast of the Aral Sea. In recent years the 1:100,000 series has only been available as a complete set covering the whole of Uzbekistan � quite an expensive option. See here for more details. 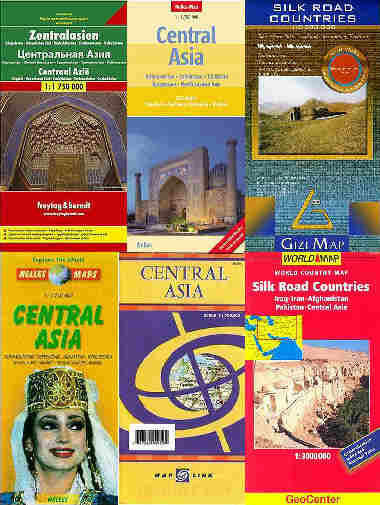 However it is now possible to purchase a complete set of both the 1:200,000 and 1:100,000 series of maps in electronic form for a mere $35, covering not only Qaraqalpaqstan but the rest of Uzbekistan as well. Contact mapstor.com. Tactical Pilotage Charts, the TPC series, on a scale of 1:500,000. 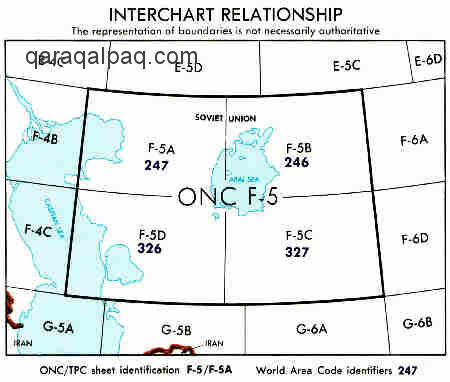 Aeronautical charts covering Qaraqalpaqstan and the Aral Sea. Such charts are useful for journey planning but totally impractical in the field. 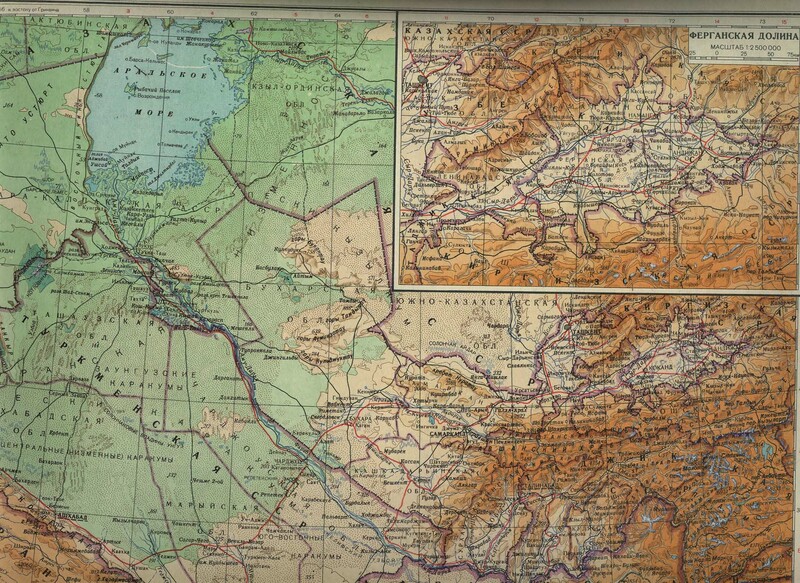 There is little in the way of mapping available on the web, apart from a rather poor Physical Map of Uzbekistan and a Map of Khorezm showing just the southern regions of Qaraqalpaqstan. 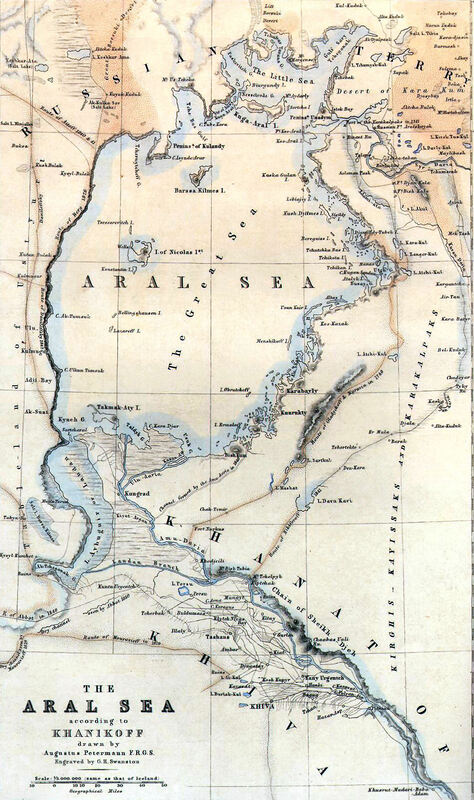 Some visitors may be interested in the first map ever made of the Aral Sea and Qaraqalpaq region. It is based on the original "Survey of the Sea of Aral" undertaken by Lieutenant Aleksey Butakov in 1848 and 1849. Butakov's scientifically produced map was subsequently copied by Augustus Petermann in London for the Journal of the Royal Geographic Society in 1853, and was then reproduced commercially as a coloured lithograph. To download a copy Click Here. 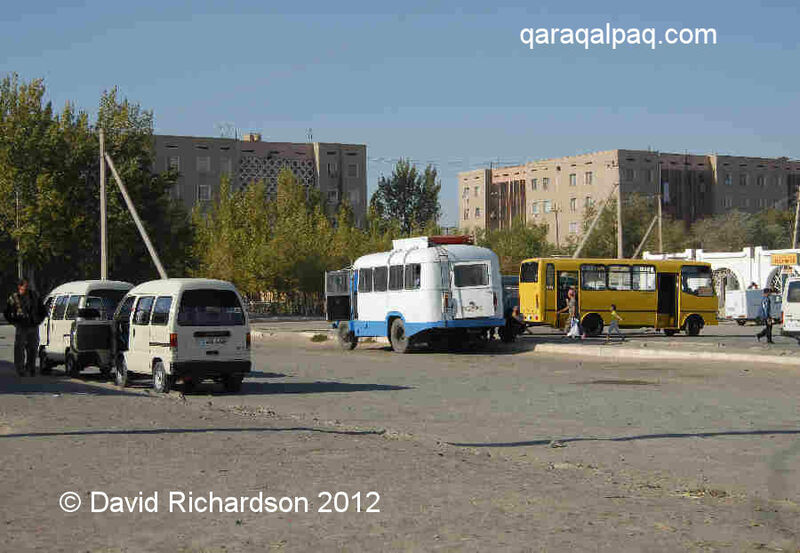 Those planning a trip around Qaraqalpaqstan should check our page covering the Geography of Qaraqalpaqstan. For those staying at a central hotel in the city, such as the Jipek Joli or the No'kis Hotel, it is quite easy to explore the downtown area of the city on foot. It takes little more than 15 minutes to walk from the offices of the Council of Ministers to the Central Bazaar. An old Soviet street map of No'kis. To see a more detailed version of this click here. Following the collapse of the USSR most of the old Soviet street names were changed, replacing Communist heroes with local heroes. Thus Karl Marx ko'shesi became Qaraqalpaqstan ko'shesi and Kuybıshev ko'shesi, named after the first Soviet President, became G'a'rezsizlik, or Independence, ko'shesi. Confusingly many locals still use the old names. The Lonely Planet street map of No'kis. Image courtesy of the Lonely Planet guide to Central Asia, April 2000. Frustrated by the lack of information we decided to produce our own downtown street map in 2007, using the currently signed street names. A copy is available for download by clicking here. It identifies the location of all the major sights, including hotels, restaurants, and banks. Normal city taxis are plentiful in No'kis although the quality of the vehicles leaves something to be desired. 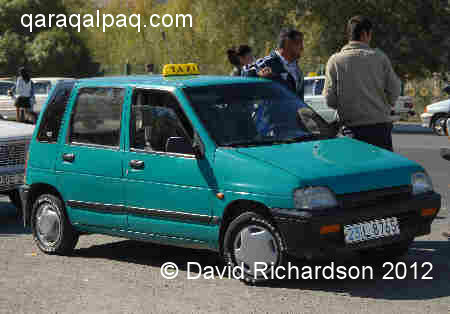 If you are lucky you will find a driver with an Uz-Daewoo Tico or Matiz, made in the Ferghana Valley. More likely you will end up in a beaten up old Lada or Moskva. A Daewoo Tico taxi in No'kis. A Russian rust bucket opposite the Central Bazaar. 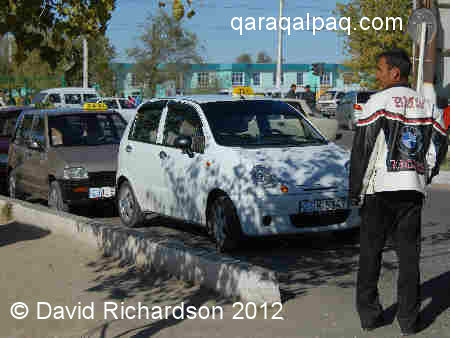 Taxis are everywhere around the bazaar, on both sides of the street especially on the corner of Rashidov. They also tend to wait outside the No'kis Hotel, in front of NEO restaurant, around the intersection of Doslıq Guzari and Amur Timur, at the railway station and at the northern bus station. Nobody has a meter � you have to agree the price with the driver in advance. As a tourist you will always be asked to pay more than a local. A short taxi ride across town costs no more than 1,000 som. 2,000 som buys you a return journey or a trip from one side of the city to the other. Taxis will happily wait for 10 minutes if asked for no extra charge. The recently launched Daewoo Matiz with a Daewoo Tico behind. Taxi rank opposite the Central Bazaar, No'kis. If you need a taxi for a longer journey, first ask at your hotel or at one of the museums. Unemployment is high and many people have friends or relatives who will happily drive you around for an agreed fee. Car hire costs have risen sharply over the past year as a result of higher petrol prices. It is always advisable to ask around on the day before you travel to get the best deal and you need to negotiate. Costs are lower for a small economic car. To complicate matters some drivers ask a fee for the journey, plus an additional fee for the gasoline. 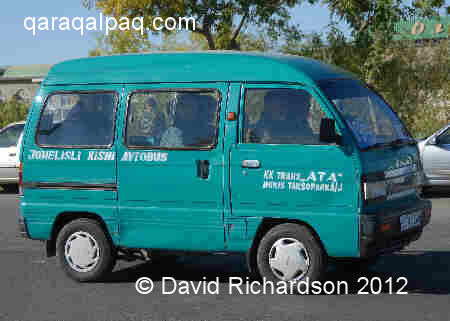 For example the opening price for a return trip from No'kis to Moynaq was quoted to us as 100,000 som plus 20 litres of petrol, equivalent to a total price of 115,000 som (just under $100). This is very expensive. It should be possible to get to Moynaq and back for around $60. On the one hand cars and gasoline are expensive items for local people. On the other you need to remember that the average salary is only $20 to $30 a month. Bargain hard! A jo'nelisli is a fixed route taxi that operates in the city. A marshrutli is a similar service that operates in rural areas, derived from the Russian marshrutnoye taxi or routed taxi. Local Qaraqalpaq people call the latter a jol taksi or road taxi. The vehicles are normally always minibuses of some kind. Generally the majority of jo'nelisli are modern vehicles - the small Daewoo Damas is a popular choice. However country jol taksi, which are often painted blue and white, are fairly old and beaten up. The most common make is the old Latvija, made near Riga in Latvia. A Daewoo Damas jo'nelisli in No'kis. A Latvija jo'nelisli in No'kis. Both generally have a route number and display a short route itinerary in the windscreen. Most jo'nelisli in No'kis organize their route via the bazaar. A short journey from the bazaar across town costs no more than 100 som. You can wave the driver down along his route and ask to be dropped off wherever you want, provided it is still on his route. Ask your hotel for the route of your nearest service. 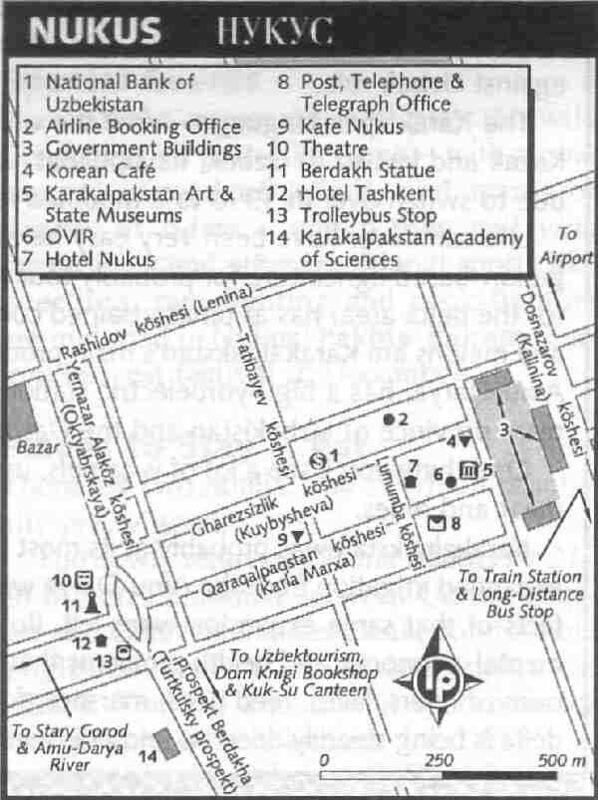 For example routes 7 and 18 go from the bazaar and pass both the Savitsky Museum and the Jipek Joli Hotel. Another antiquated jo'nelisli in No'kis. 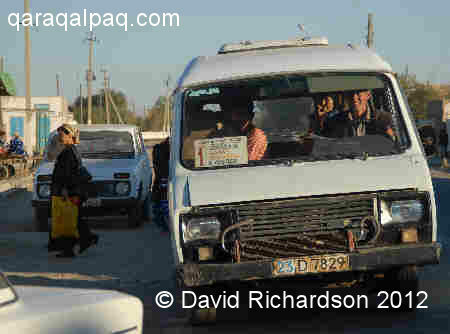 In country districts most jol taksi are organized to take people from their local village or awıl to the nearest bazaar. They tend to ply the country roads going from village to village. Services are particularly busy on a Sunday when the whole rural population is off to the nearest vegetable or livestock market. Again the vehicles display their route number and a short itinerary. 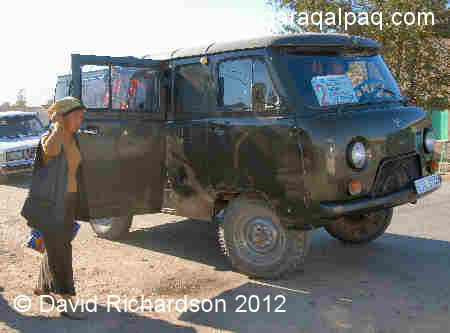 A more rugged Russian 4-wheel-drive UAZ jol taksi in the country. As an indication of longer distance prices, a fixed route taxi from No'kis to Shımbay costs 3,000 som, considerably more expensive than the local bus. 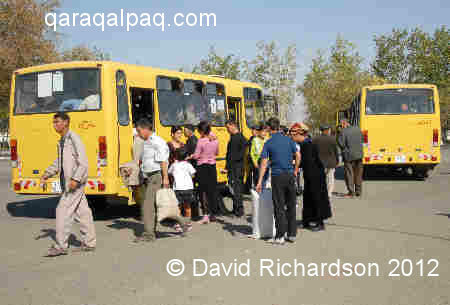 There are several bus stations in No'kis, each serving a different outlying district. All buses from the north leave from the bus station or autovokzal on Dosnazarov ko'shesi, not far from the airport. The bus station next to the railway station services the southern regions. There are no ticket offices, you pay on the bus. The buses have no fixed timetable � they go when they are full. The northern No'kis bus station. The bus station in front of the railway station. 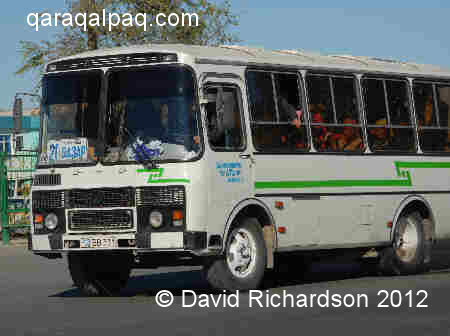 Modern Isuzu buses dropping off passengers in No'kis. There are some very smart modern buses now providing services out of No'kis. However country buses range from bad to worse. A popular make is the KAvZ or Kurganskiy Avtobusny Zavod from the Russian city of Kurgan. A country bus bringing in locals to the No'kis Central Bazaar. The very crowded No'kis to Shımbay bus picking up passengers along the roadside on a Sunday morning. The same bus dropping off its passengers at Shımbay Sunday bazaar. Once again, travel by bus is not recommended on a Sunday morning when many people are going to market with their bulky produce and livestock. It costs 500 som to travel from No'kis to Shımbay by bus. 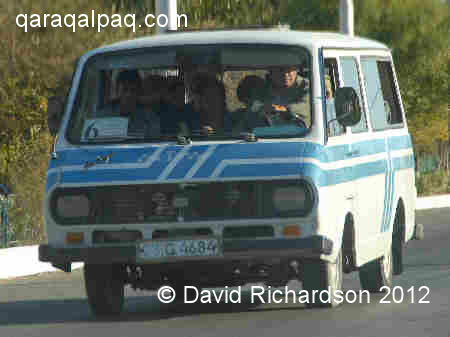 The best way to get around Qaraqalpaqstan is to hire your own car and Qaraqalpaq driver. Aim to find someone with a Daewoo Nexia or Matiz. These are quiet, comfortable, and air conditioned and can zip along the straight roads that criss-cross the delta at considerable speed. Ask your hotel or landlady if they can recommend a contact or ask at one of the museums. A Qaraqalpaq driver will know the region and can open doors for you that would be impossible on your own. Allow a minimum of $50 a day, probably more. It will be worth every penny. It is even possible to hire a stretched limo in No'kis. 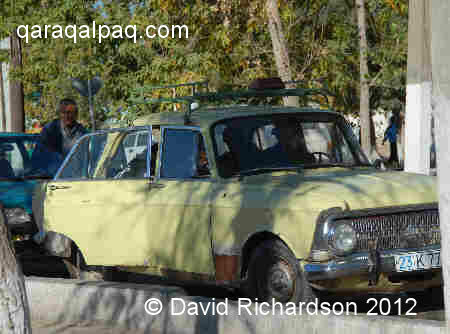 For those wishing to explore more remote regions, such as the Ustyurt, the Aral Qum, the very northern part of the delta, or some of the more remote archaeological sites such as Qoy Qırılg'an qala, a 4WD such as a UAZ or Niva is vital. Again ask drivers around No'kis if they know anybody. Many local men go hunting in the remoter areas of the delta and they make ideal guides as they know these off-road regions. In 2007 we paid the equivalent of $60 to hire an experienced off-road driver and his 4WD jeep for the day for an expedition into the wilderness 65km north of Qarao'zek, returning to No'kis in the evening. Bes Qala Nukus can organize a two day camping trip to the Aral Sea, offering a choice of off-road vehicles, each accommodating up to four passengers. A Russian UAZ "Hunter" costs $170 a day including fuel and driver; a UAZ "Patriot" costs $190 a day; while a Toyota Land Cruiser will set you back $200 a day. An English-speaking guide/cook is an additional $25 a day, while the provision of one breakfast, two lunches, and one evening dinner is a further $30 per person. Bes Qala Nukus can also supply tents, sleeping bags, and camping equipment - for example, the hire of a two-person tent is $10. These prices are higher than you could expect to negotiate privately, but you are paying a premium for a driver who knows this rarely visited region. Anyone considering planning an expedition to the shores of the Aral Sea should ideally arrange to take two 4WD vehicles for safety. This is a very remote region devoid of habitation and you rarely see any other vehicles � at best one every few days. With only one jeep, a breakdown on the desolate Ustyurt plateau could prove fatal. 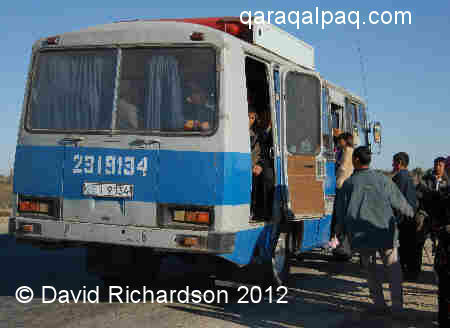 We have rarely been stopped by road police in Qaraqalpaqstan. 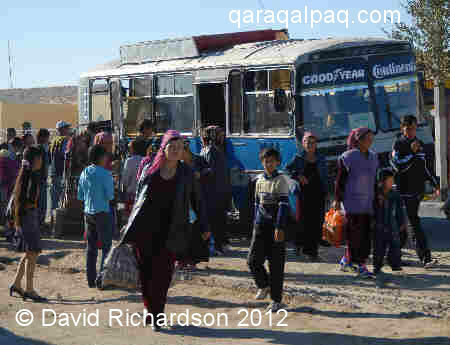 The main road police checkpoints are as you enter Qaraqalpaqstan from Uzbekistan � where the A380 crosses the southern border before Miskin, at the border between Gurlen and Man'g'ıt, and after crossing the pontoon bridge from Khorezm at Biruniy. There is another formal check point at Raushan, before driving up onto the Ustyurt. 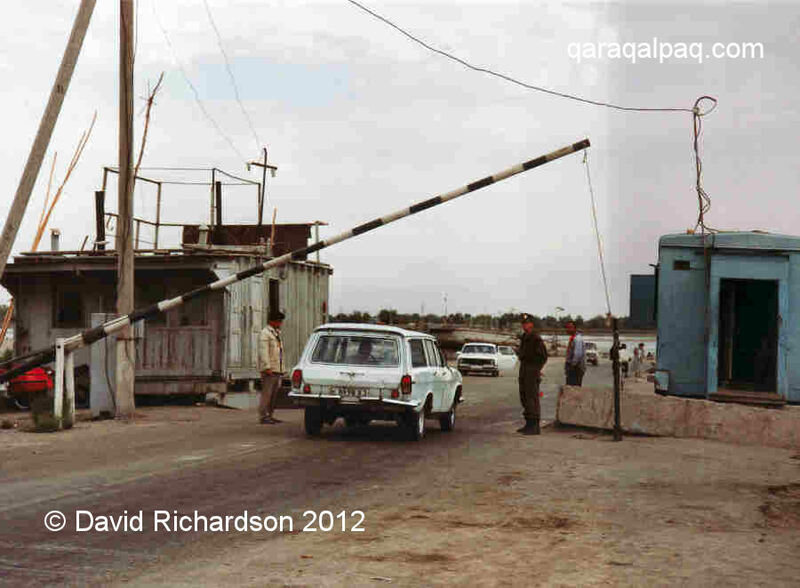 Checkpoint leaving Khorezm viloyati to cross the Urgench-Biruniy pontoon bridge into Qaraqalpaqstan. There are numerous other checkpoints where you only stop if you are flagged down by an officer. 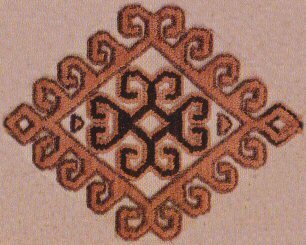 There is one by the modern Amu Darya bridge between No'kis and Xojeli, one on the road between No'kis and Xalqabad, one near to the Shomanay junction on the main Xojeli to Qon'ırat road, and another up on the Ustyurt beyond Qon'ırat. Sometimes the police hang around by the roundabout close to the Derbent Motel. Unlike Tashkent, No'kis is pleasantly free from traffic cops so cars speed around the city unmolested. The one exception is at the busy main crossroad in front of the Central Bazaar. Visitors who just want a taste of local rail travel might consider using the train to get from Khiva to No'kis. In the past there has been a daily early morning train from To'rtku'l to No'kis and back. Details of the 6442 service to No'kis, departing at 0840. The To'rtku'l station arrivals and departures board. Image courtesy of Helmut Uttenthaler. There is also a daily service connecting Qon'ırat and Shımbay via No'kis. The 6439 leaves No'kis for Shımbay at 1050, while the 6440 leaves No'kis for Qon'ırat at 1429. Remember that timetables change so ask your hotel to check the day before. 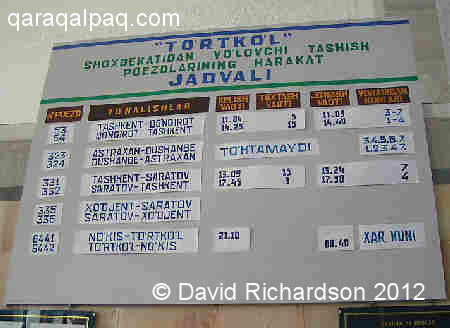 For details of train travel in Uzbekistan and Qaraqalpaqstan see our How to Get There By Rail page. 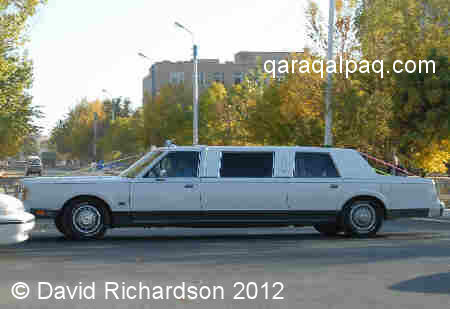 Adventurous visitors might want to explore Qaraqalpaqstan by private charter plane! Local Uzbek travel agents have recently been chartering an Uzbekistan Airways Antonov AN-2 single propeller bi-plane for private flights over the southern Aral Sea from No'kis. The flight duration is around 2½ to 3 hours and the route takes you out over the delta towards Moynaq and the dried-up bed of the Aral Sea. It returns to the east across the Beltaw Heights and Taxta Ko'pir. An alternative flight is offered from the airport at Urgench in neighbouring Khorezm, flying into southern Qaraqalpaqstan to see the archaeological sites of Ancient Chorasmia from the air. The cost of chartering the AN-2 for 3 hours is in the order of $1,500 to $2,000. An AN-2 will normally seat about 12 people, although you probably need to restrict numbers to about 6 so that everyone has a window view. This still makes the trip readily affordable for a small tour group. Johan Rehn with his pilot and navigator in front of the Antonov AN-2 at No'kis airport. Image courtesy of Johan Rehn. Travellers contemplating such a jaunt are recommended to visit the website of the Swedish adventurer, Johan Rehn, who made a similar trip in July 2005 and photographed some of the highlights for posterity. 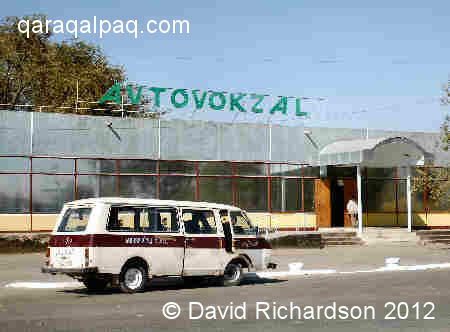 Johan booked his trip through Shoista Agzamova, who he recommends highly. She now runs her own tour agency in Samarkand, appropriately named Samarkand Travel. She can be contacted at shoya@mail.ru. An alternative might be to organize a flight over the Aral Sea or the Chorasmian qalas directly through a local Qaraqalpaq tour operator such as Bes Qala Nukus or indirectly through the reliable Ayimtour which is owned by the Jipek Joli hotel in No'kis. Either way you must submit a letter of application at least one month before the intended date of the flight, which is forwarded to the security department in order to obtain formal permission for the flight. 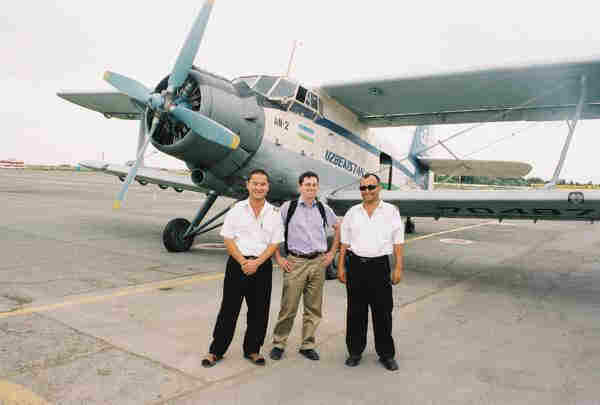 The cost of an Antonov AN-2 is $450 per hour. There is also a one-off airport charge of $60 and a departure tax of $8 per passenger for foreigners ($4 for Uzbek citizens). Bes Qala Nukus can even arrange the hire of a large Russian helicopter, although this is much more expensive. An MI-8 costs $1,640 per hour and an MI-8 MT $1,950 per hour. Passenger departure taxes are the same but the airport charge is higher at $120. This site was first published on 1 April 2008. It was last updated on 2 March 2012.